The ViewSonic PX706HD ($650 street) is designed with a focus on video gaming first and home theater second. The most obvious gaming-related feature is the 16.4 ms input lag, as fast as it gets on projectors and ideal for serious gamers. It also has much better than typical on-board audio, which makes it particularly suitable as a portable gaming projector. But most of what makes it good for gaming also lets it serve nicely for home theater - Full HD 1080p resolution, a 16:9 aspect ratio, Full HD 3D capability, and crisp focus across the entire screen. It can even handle business presentations well, and it has a USB Type C port (as well as VGA and HDMI) for input from a laptop. That plus its 6 lb. 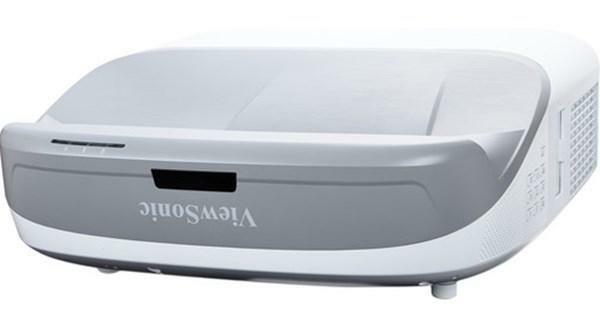 portability makes it well designed for both home entertainment and business use. Another major feature is its short throw lens - it can fill a 120" diagonal screen from as little as 6 feet throw distance, giving you a lot of installation flexibility in smaller spaces. The PX706HD scores well on brightness too. Our test unit measured over 2700 ANSI lumens in its brightest color preset and almost 1650 lumens in Movie mode, which is a lot brighter than the Movie or Cinema modes on most home theater projectors. Eco modes. The ViewSonic PX706HD's Eco mode lowers lumen output by about 33% compared with Normal. The menu offers two additional Eco choices, but they aren't Eco modes in the usual sense. Dynamic Eco works like an auto-iris to adjust lumen output based on the content of the image. SuperEco lowers image brightness by up to 70%, but only when the image stays static, as when you pause a movie. As the soon as the image changes, however, the lamp mode switches back to Normal, so you have to set it to SuperEco manually each time to take advantage of the feature. Color Brightness. Using the Brilliant Color default settings of 10 (and 8 in Movie mode), color brightness ranges from 24% for the Brightest color preset, to 34% to 37% for Sports, Standard, and Gaming, to 45% for Movie mode. Color accuracy is surprisingly accurate despite these readings whch are more typical of business presentation projectors than home theater projectors.As you step down the Brilliant color setting, total lumen output is incrementally curtailed, colors become more vibrant, and color brightness increases as a percentage of white brightness. Since the Movie mode puts out over 1600 lumens in default mode, many home theater users will prefer to adjust Brilliant Color downward to cut some of that light and increase color saturation for dark theater viewing. Brightness Uniformity. The measured brightness uniformity for our test unit was about 60%--lower than desirable but typical for home theater projectors in the $700 price range. On a 100% white test image, the brightness drops along the left and right sides of the picture. Though visible on a flat field test pattern, most will never notice it since when viewing games and movies one rarely focuses attention on the edges of the screen. Video Performance. 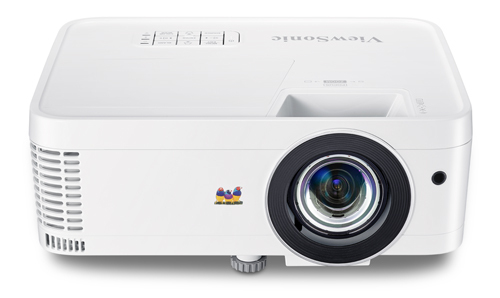 The PX706HD earns high marks for a projector in its price range for video performance. The image is crisply focused from edge to edge--at least, it is if you stay within the recommended 120" maximum size--which is often a problem for short throw lenses. As with most DLP projectors, it also delivers nicely saturated color and dark black with all of its color presets, and it scores well for the price on contrast, shadow detail, and three dimensionality. Note that it has almost no video processing options, however. The menu includes a Sharpness setting, for example, but ViewSonic says it works only for composite video input. Color Preset Mode Performance. Like the brightest mode in most projectors, Brightest has enough of a green bias to notice even without comparing side by side with a reference projector. Colors are not as vibrant as in the other modes, which makes a picture of a sunny day look overcast. However, since it is the brightest option overall, you might be willing to use Brightest mode occasionally for casual viewing in high ambient light. Sports, Standard, and Gaming modes all came in at similar brightness using default settings for our test unit, at about 1,960 to 2,125 ANSI lumens--more than bright enough to light up a 120" screen in moderate ambient light. Colors for all three modes look subjectively natural and realistic. However, comparison with a reference projector shows that Sports mode has a slight green bias, while Standard and Gaming modes have a slight blue bias, which most people find more acceptable. So if you don't want to adjust settings, you'll probably prefer Standard or Gaming mode. All three modes are easy to adjust for more accurate color, and all three wind up at essentially the same 1,900 ANSI lumen brightness. Gaming mode delivers the best contrast, shadow detail, and three dimensionality of the three, but they all do a good job on all three counts for a sub-$1000 projector. Movie, as the mode with the lowest brightness, is the obvious choice for film and video in a dark room. With default settings it also has a slight blue bias, but adjusting it for more neutral color is easy. It is the only color preset mode with a default Brilliant Color setting of 8 instead of 10. Step down to lower settings, and colors become increasingly richer and more saturated with each step. However contrast, along with brightness, also drops a bit at the lower settings, so you'll want to experiment to pick the setting you like best. Video Optimized Lumens. After adjusting for optimum image quality, Movie mode measures just a touch lower than with default settings, at about 1,525 lumens in Normal power mode. That's still enough in moderate ambient light for a 120" 1.1-gain screen. Even in Eco mode, at 1,050 lumens, it is in the right range for a dark room to light up a 120" screen. Presentation Optimized Lumens. The PX706HD can display sharp, clean, high contrast text docs, spreadsheets, PowerPoint materials, and graphics and photos for business presentation. Sports mode with default settings gives the best balance of brightness and color accuracy. At 2,127 ANSI lumens, it delivers enough brightness for a 120" screen in bright office lighting. 3D Performance. The PX706HD offers Full HD 3D support with DLP-Link glasses. As is typical, the 3D picture is much less bright than 2D, so you may prefer a smaller image size for 3D viewing. I didn't see any crosstalk in my tests and saw just a hint of 3D-related motion artifacts. Input lag. The 16.4 ms input lag with 3X Fast Input on makes the PX706HD among the fastest of today's projectors. Even with the feature off the lag is only 33.1 ms, which is easily fast enough for casual gamers. Note that the 3X Fast Input feature works only with 1080p input, and ViewSonic says the only effect on image quality is that turning it on disables keystone. Rainbow artifacts. Like most current generation DLP projectors, the PX706HD shows rainbows less often than earlier generation models. However sensitivity to these artifacts lies along a spectrum, and some people still find them bothersome. If you don't know where you are in that spectrum, buy from a dealer with a friendly return policy so you can see for yourself whether the rainbows are a problem for you. Fan noise. As with any projector that combines small size, light weight, and high brightness, the PX706HD's fan noise is audible in quiet moments in both Eco and Normal power mode in a mid-size room. Eco has the kind of steady hum that is only a little louder--and no more distracting--than a ceiling fan. Normal raises the volume a bit and adds a whooshing sound. Neither should be a problem in a family room with ambient noise. In a traditional home theater with lights off, Eco mode is more than bright enough for the maximum recommended screen size. ViewSonic recommends using High Altitude mode at 4921 feet and above. With it on, both modes add a high pitched overtone and higher volume. If you live where you have to use High Altitude mode, you'll probably want to limit the PX706HD to Eco mode. On-board audio. Thanks to a large speaker chamber and a more powerful than typical amplifier, the PX706HD delivers much more robust audio than you would expect from its 5-watt speaker. The resulting sound is both high quality for a projector and easily high enough volume enough to fill a mid-size room. Lamp life. ViewSonic rates the PX706HD lamp at 4000 hours in Normal mode, 10,000 hours in Eco, and 15,000 hours in Dynamic Eco. Replacements are $149. Warranty. The PX706HD includes a three-year warranty for the projector as standard along with a one-year warranty for the light source and one-year express exchange. Throw distance and Optimum Image Size. The PX706HD's throw distance for a 120" image ranges from 6' to 7'3". Due to the wide-angle short throw properties of the lens, ViewSonic recommends no more than 120" image size for optimum sharpness. However, our test sample was sharp up to 130" without any apparent softening of focus. 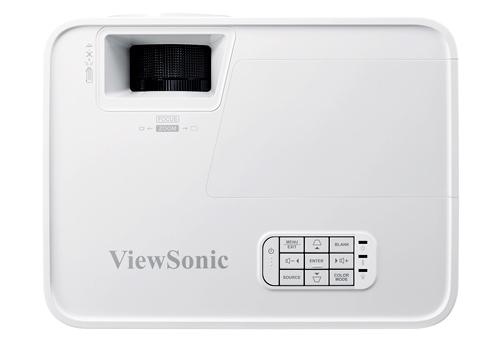 To find the throw distance range for the image size you want, see the ViewSonic PX706HD Projection Calculator. Vertical offset. With the PX706HD sitting on a table, the bottom edge of the image is at the centerline of the lens, which is an appropriate design choice for a projector you are most likely to set up on a table in front of the screen on an ad hoc basis. If you install the PX706HD in a ceiling mount you may want to use an extension drop tube to position the projector at a height equal to the top edge of the image. Alternatively you can tilt it downward to hit the screen and adjust the vertical keystone by +/-20% to square off the image. However, keep in mind that keystone correction is disabled when the projector is set in its fastest 16 ms input lag, so it may not be an option for serious gamers. Also, keystone correction is best avoided whenever possible since it can introduce image artifacts due to rescaling. In addition, aggressive correction can lower brightness. If you want a lightweight 3D-capable 1080p projector for gaming, home theater, and possible business use, the ViewSonic PX706HD is an excellent value at $650. Serious gamers will welcome the 16.4 ms input lag, especially since you don't have to sacrifice picture quality to use it--something you can't say for all of the competition. Whether for gaming, home theater, or business use, the PX706HD delivers high enough brightness for its maximum recommended 120" image size to stand up to moderate ambient light while delivering natural color well within a realistic range. And it is easily bright enough to fill a larger screen as well, although the focus may be a little soft depending on how large you go. 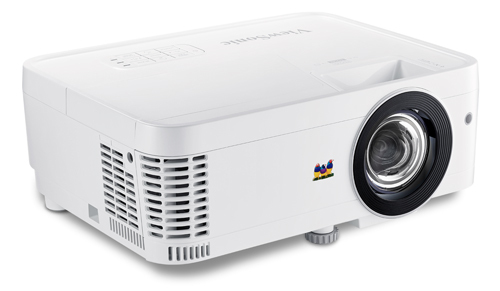 The ViewSonic PX706HD offers Full 3D, robust onboard audio, 16 ms lag, a short throw lens, and a best-in-class three year warranty for the projector and one year for the lamp. That is a unique combination of features for $650 (current street price), and it adds up to an excellent value in today's market. Is it possible to use this device with a projection distance of 2.80m in order to obtain an image base of 325 cm? Our projection calculator should allow you to determine the range of image size for a particular throw distance. It can be set for U.S. or metric distance as needed. 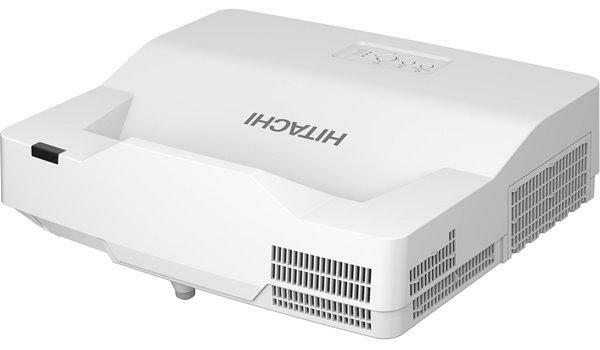 How does this projector compare to the BenQ alternatives of the TH671ST or the 2150ST? Also is there any major disadvantage of ST vs standard throw?